I start HeidiSQL.exe. 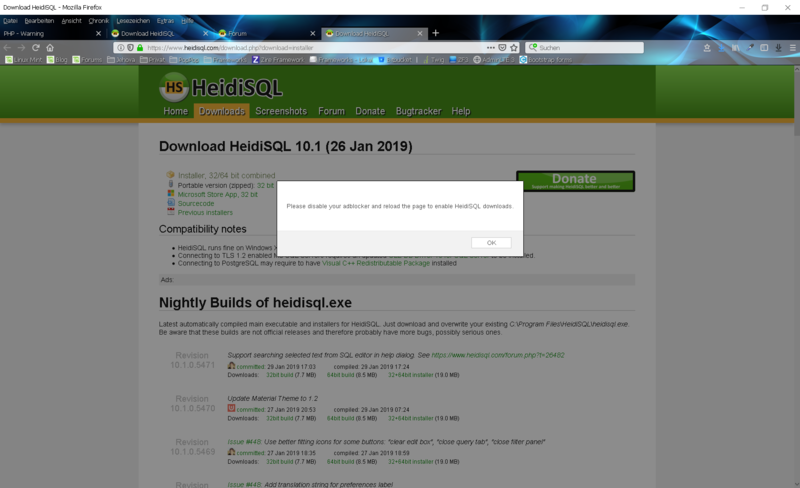 Check for updates and HeidiSQL open the browser. I see a alert message with "Diasble your add blocker". I click ok. And now i see this red message of your page. You see no ads, so maybe you have some ip blocking or the ads just did not load. Don't worry too much on that. In the red box you can read how to download in that case. I don't see the message with Google-Chrome. Only with Firefox v65. Thx for your nice work. I love HeidiSQL. I've always used an ad-blocker, hate adds, love free stuff. Once in a while, you come across something you need, which is 95% of HOW you like it and it IS worth going that extra mile. I don't like paying for software, but I've not found a free MySQL GUI that does what I need, efficiently, cleanly without the bloat. HeidiSQL is what I have been looking for, I've had stability issues, but ansgar has been responsive and these are being ironed out. Heidi is 95% there for me now, so I've got no issues with removing my Ad Blocker for this site. Give me a Linux native version and I'd at 99.9...% and donating. I do see the red banner on Chrome, maybe another extension you're running is interfering with it.